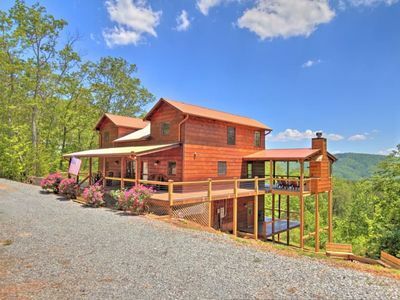 If you have high expectations for your Blue Ridge mountain vacation, you will experience the height of exhilaration at Sky High Lodge. 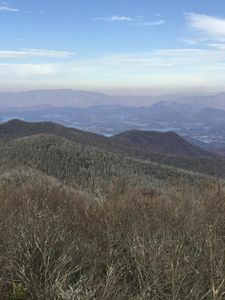 Stunning panoramic Blue Ridge mountain views from top of the world at Sky High Lodge will surely take your breath away. 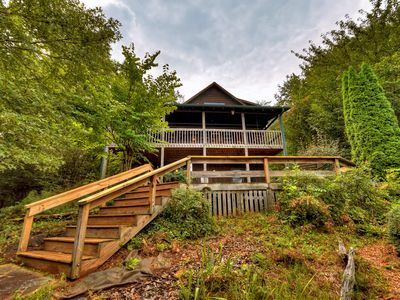 While just 10 minutes from Historic Downtown Blue Ridge on all paved roads, you will still feel a million miles away while losing yourself in North Georgia mountain vistas as far as the eye can see. 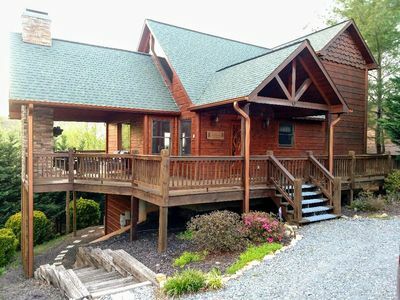 Boasting 6 bedrooms and 3.5 baths, Sky High Lodge is the perfect Blue Ridge cabin rental in North Georgia for friends and family to reconnect, recharge, and relax. Upon entrance into Sky High Lodge, a breathtaking surprise awaits as you round the black iron custom design of mountain scenes camouflaging the staircases to the top floor and the terrace level. 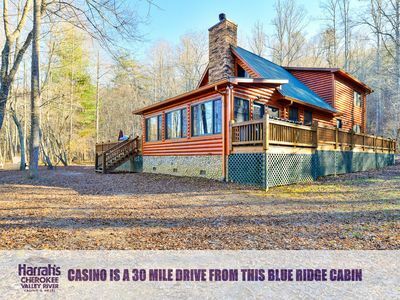 Once you round the corner, your senses will be heightened and your breath will be taken away, not only at the luxurious setting, but the incredible Blue Ridge mountain vistas out the wall of windows. 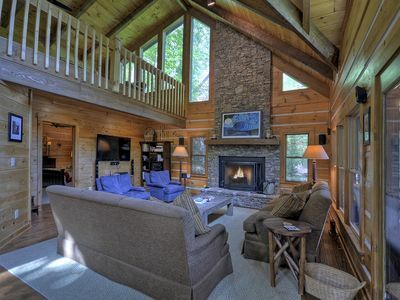 Two spacious living areas in an open floor plan on the main level provide respite from a weary world while panoramic mountain views will leave you breathless, but refreshed. Easily and comfortably accommodating 12 guests, everyone will have spacious opportunity to spread out and not feel on top of each other. 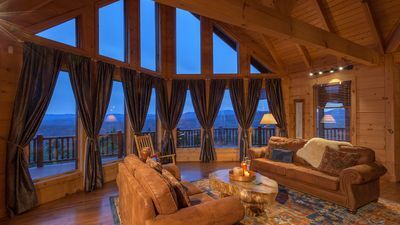 To sit in coziness before a beautiful stone gas fireplace and marvel at a layered mountain view will calm even the most restless of spirits. An open gourmet kitchen flanks one of the living areas providing an ideal entertaining atmosphere for you and your guests. With a table for eight and a second table for four, meals can be enjoyed together in the heart of the home. 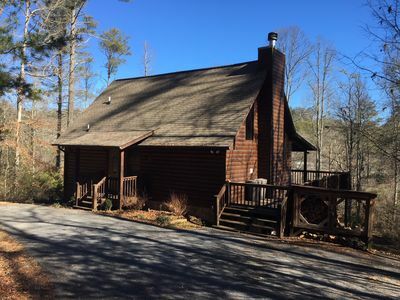 Featuring a professional grade gas stove and oven, refrigerator and separate freezer, ample countertop space and kitchen accouterments, the most discerning chef can prepare a memorable meal for everyone. Procure locally grown produce at one of the many farmer's markets around or grass-fed beef at local markets and create a mouthwatering feast for your family and friends. 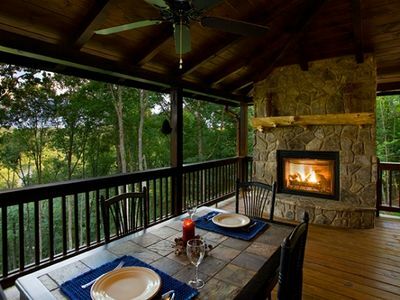 With a gas grill and seating just outside the deck from the kitchen, meal preparation is a joy with such a beautiful backdrop of layered mountains. While outside, breathe deeply the clean fresh mountain air, but be sure not to let the views take that breath away! 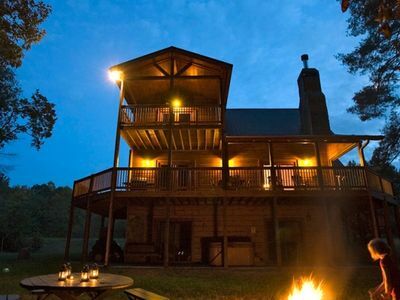 Enjoy conversational seating, a porch swing, al fresco dining, and a gas grill as you watch the skies turn pink, purple, and blue during the sunset of a fabulous day. If dining out is your preference, head down the road just a few minutes and you'll be in Blue Ridge ready to choose from some of the best foodie restaurants in the area - Harvest on Main, Treo's, Black Sheep, Mystic Pizza, Masseria, just to name a few of our favorites. Or if you head in the oppostie direction to McCaysville, you will marvel at the renovation and rejuvenation of this small town. With riverwalk shops and restaurants on the river, you will enjoy the best of both worlds in Blue Ridge. Heading downstairs to the terrace level, you will discover a spacious living area offering comfortable seating, a pool table, and a large screen TV for your entertainment. This provides an ideal hangout for the kids in your group. Challenge your family and friends to a friendly board game or two that are provided. Set outside for a dip in the hot tub and marvel at the millions of stars hanging so close you can touch them! At the end of the day, take the stairs to the top floor and discover two King Master Suites w/ private bathrooms, an idyllic space for restful repose on sumptuous mattresses and luxurious bedding fit for a king and queen. Sink into your luxury bed and discover the best night's sleep you've had in a long time. Both private sanctuaries provide televisions. Downstairs on the Terrace Level, four Queen bedrooms await your weary bodies as you sink into sumptuous sheets and fluffy pillows. One spacious bathroom serves these bedrooms. 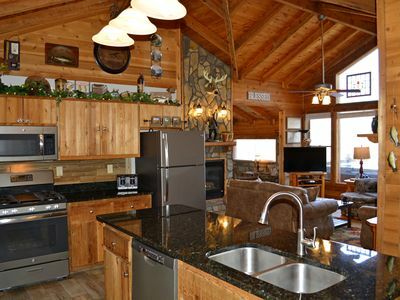 Luxurious Sky High Lodge is located in close proximity off Hwy. 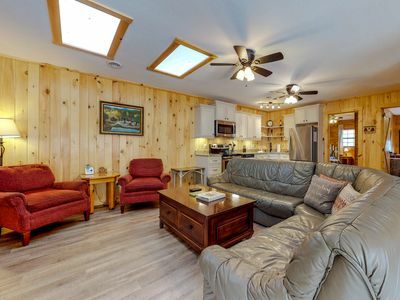 5 (within 10-15 minutes) to Cadence Ridge, Mayfly Lodge and Treehouse, Rolling River Cabin, Riverview Lodge, Outlaw Ridge , and Fallen Timber Lodge. 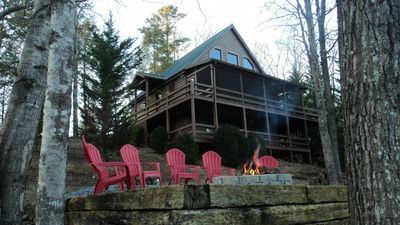 During the summer months you are within 30 minutes to Ocoee River whitewater rafting (where the 1996 Summer Olympics were held) and Toccoa River tubing and kayaking. Supremely located between the newly rejuventated town of McCaysville, GA and historic downtown Blue Ridge, GA, be sure to visit Mercier Orchards, the South's favorite apple orchard, which is only 5 miles down the road. Offering bakery delicacies, gourmet foods, fresh farmer's market fare, and gift shops this is a must see! During harvest months, participate in hay rides and produce-picking events that will leave unforgettable memories with your family and friends. The town of Blue Ridge offers great shopping boutiques, trendy restaurants, breweries, and galleries. McCaysville offers the riverwalk shops and restaurants, breweries, and antiques. 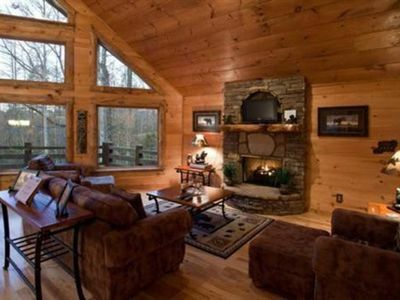 Sky High Lodge is an excellent base for your getaway in the North Georgia Mountains. 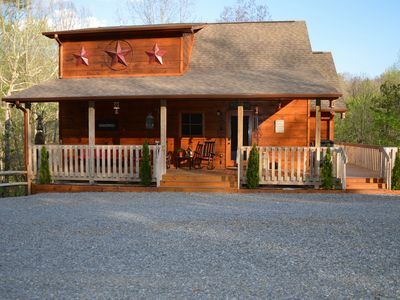 Whether you're looking to enjoy a true mountain experience, surrounded by panoramic mountain views, shopping in nearby downtown Blue Ridge or McCaysville, or whitewater rafting in nearby Ocoee River Whitewater Center, horseback riding at outfitters closely located, it's all here at your doorstep. Food lovers are well catered to as there is something for every palate - from our typical Southern fare to our gourmet delights from some restaurants in Blue Ridge. 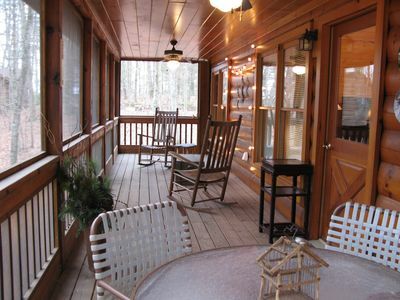 If you fancy preparing your own meals in the well-appointed gourmet kitchen of your Blue Ridge luxury cabin, then there is a fantastic array of gourmet shops and farmer's markets selling local produce and grass-fed meats as well as award-winning wines in various wine shops in town. 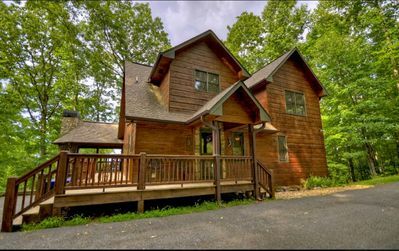 Experience a stay at Sky High Lodge and realize what it means to completely decompress and relax with those whom you love most. You will leave with unforgettable memories and yearn to return to your special place on top of the world. 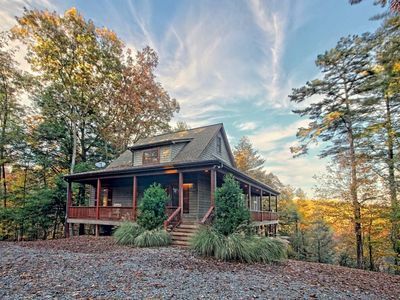 Spectacular Mountain Cabin with breathtaking views & 6 minutes to downtown! 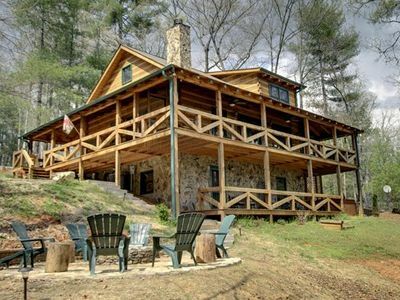 SERENITY IN BLUE RIDGE ASKA AREA SEEK NO MORE NEAR ALL ACTIVITIES & MORE!!! 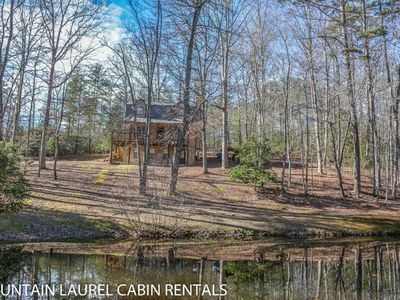 Enjoy the sounds of the rustling waters of Fightingtown Creek while soaking in a mountain view. 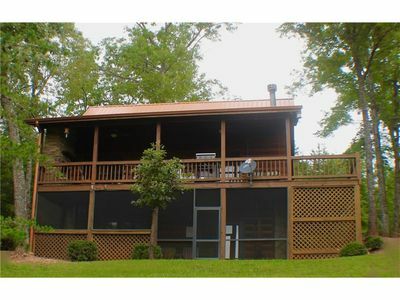 A River's Bend - Outdoor Fireplace - River/Mountain Views - Private!